It's time for yet another FlexBooker improvement! As we strive to create the perfect online booking solution for you, we are continuously releasing improved and new features throughout the app. Today we've released automated timezone translation. What does that mean for you? Well, if you have customers who book appointments with your business from other parts of the country (or even the world) then when they book online using your FlexBooker widget the times they see will automatically be in their timezone. When they get confirmation messages, or reminder or wait list emails and text messages, they will reference the time in your customers timezone. But for you, when using the FlexBooker management site, all the times will still be in your timezone. We think this will be a great improvement for our business customers who serve clients in different timezones, especially for their customers, all without introducing any extra steps or headaches for you. We're always working to improve FlexBooker, and part of that continuous improvement, is exciting new releases. Here's what we've just pushed out the door for our fantastic customers. We're proud to introduce our new user interface. We've completely re-imagined the management area from the ground up. It's even faster, more intuitive, and easier to navigate. We've improved our reporting area, making the charts more readable, and introducing tables for all results. We've also added some new reports for you, including booking revenue data. Even more reports are on their way shortly, too. 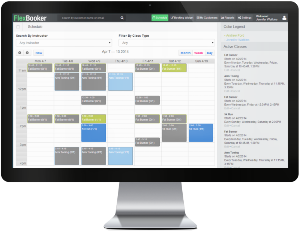 Your customers will now be able to use calendars to choose their desired booking from your schedule, right inside the FlexBooker widget. Users can switch between day, week, and month view. 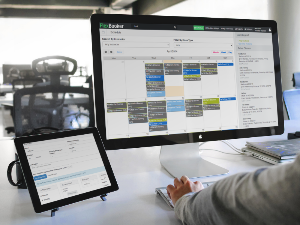 FlexBooker now has improved multi-device support, making it easy for you to manage your bookings and schedule from any computer, laptop, tablet, or even right from your mobile phone.